SOW Asia looks primarily at the problem and the solution within an addressable market and the quality of the team. SOW Asia is aware of the issues of additionality and attribution but is not sure if they have been able to address the challenges in answering them. While they have strong anecdotal evidence to prove their value-add through the two accelerator programmes, there is not an exclusive causal link between these programmes and the success of the enterprises, nor should this be the case. SOW Asia tested the SROI framework but cited cost and complexity for smaller enterprises as the big challenges to easy adoption. 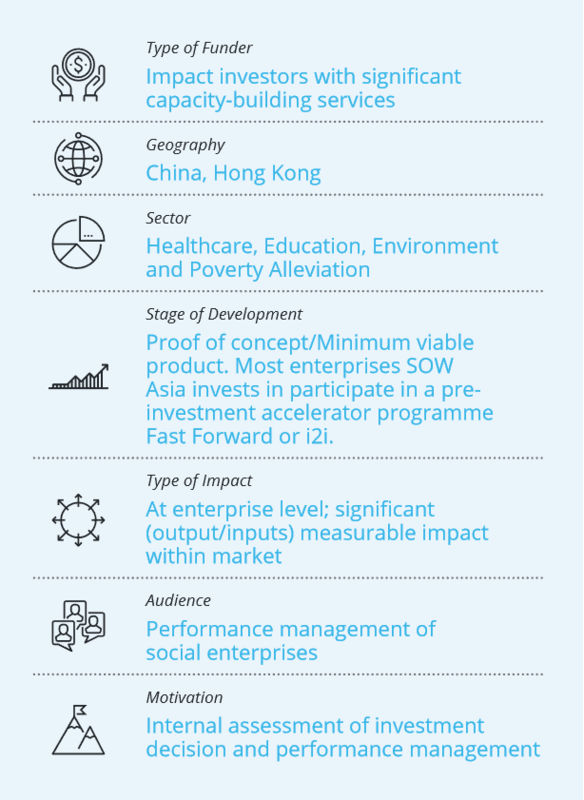 SOW Asia is currently using in-house scorecards to measure the economic performance and social value creation against the initially agreed objectives. SOW Asia are cognizant that gathering and reporting impact numbers is a challenge. They tried to address this by designing metrics that allow for data to be used for making business decisions. This makes data valuable for more than just reporting with greater buy-in. Most of the reporting is done through internal documents and for performance management.